Nu-Perspective, home of revamps and updates of various forgotten and underdeveloped Nubian (black) characters, is back a little later than expected but back none-the-less. And we brought a character that has been HIGHLY requested for the Nu-Perspective treatment. The first character for November is none other than STATIC!!! And while Static is certainly popular, he remains a highly underutilized character. If you happen to not know who he is, Google his original look and story, and let us know if you like what we did with him. Then see ya next week with another Nu-Perspective. 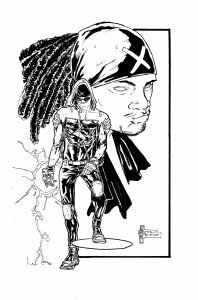 Story: Granted electrical superpowers when he was exposed to an experimental tear gas during an all-out gang war, young Virgil Hawkins devoted himself to becoming a superhero known as “Static”. After joining a ragtag group of heroic “Bang Babies” and defending his community for years, Virgil went into semi-retirement as meta-human criminals dwindled and normalcy slowly returned to Dakota. Nostalgic for the glory days of his exuberant prime, Tiffany Evan’s (Technique) tech and Raquel Ervin’s (Rocket) social work rendered superheroes obsolete. But when industrial espionage linked to the debunked Alva Technologies puts Tiffany back into her Technique suit, and a new epidemic of “Bang Babies” creates volatile social tensions forcing Raquel to dust off her inertia belt, Virgil can’t help but think these two separate events may be related. This is further solidified by the mysterious appearance of “Dusk”, a former fling confirmed KIA (killed in action) defending the city years ago. With Icon off-world, Virgil steps up to the plate to be the leader of Dakota’s heroic crime fighters against all-new enemies and old adversaries. But as Virgil’s battle on the streets escalates, a darker conspiracy slowly unravels, hinting at a reconstituted Shadow Cabinet with seemingly nefarious ambitions. Powers/Abilities: Virgil has the metahuman ability of electromagnetic-kinesis. He can self-generate and discharge a large amount of electricity, as well as generate powerful electromagnetic fields and force fields. He can sense electrical currents in his immediate environment and can also absorb electricity from external sources to boost his own bio-electricity. Through his years of training, Virgil can lob explosive lightning orbs, create electrical tethers, levitate large metallic object like cars as well as large quantities of metallic debris with great dexterity. He can even discharge lightning with incredible accuracy, such as being able to arc and careen around obstacles, almost “homing in” on the desired target. As his name suggests, he can generate a static field that allows him to adhere to surfaces and magnetize objects. At the extreme, Virgil can convert and revert his entire physical body into pure electrical energy to transport through electrical wires or circuits but he cannot maintain this form for prolonged periods of time. Virgil is also an accomplished polymath, with genius-level intelligence and an aptitude for electrical engineering and design, as well as biochemistry and physics. Weapons/Paraphernalia: Utilizing some of Tiffany’s lightweight armor, Static’s suit has a bullet-proof and fire-retardant lining. His stylized goggles protect his eyes from the flash of his powers, as well as have a built-in radio and wifi-receiver and computerized analyzing software. He also has an array of gadgets like a “static mine”, and trackers. His main mode of transportation is his customized “static saucer”, a wide disc that he can levitate with his powers and maneuver exceptionally well in the air.